Many DJs prefer to use controllers: dedicated pieces of hardware which allow hands-on control of DJing software. 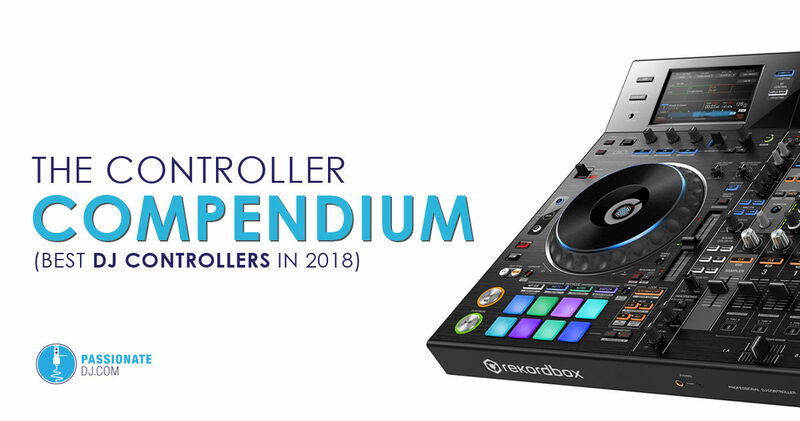 This guide will help you compare the best DJ controllers currently available, and make sure you’re well-informed, so that you can make a smart choice! New to DJing? Check out DJ Courses Online. The development of robust DJ software, along with the hardware to control it, has been one of the most significant things to ever happen within the industry. The hardware market continues to grow, and people are now able to choose a controller which fits their budget, workflow, and choice of software. This is wonderful news for DJs, but it also makes the shopping process difficult. While the needs of every individual DJ will vary, this guide is meant to help you make an informed decision, so that you can feel confident when spending your hard-earned money. These controllers are the cream of the crop when it comes to full, in-the-box DJ solutions. They are professional grade, have a high level of hardware-software integration, and are rich in features. They also come with a premium price tag! 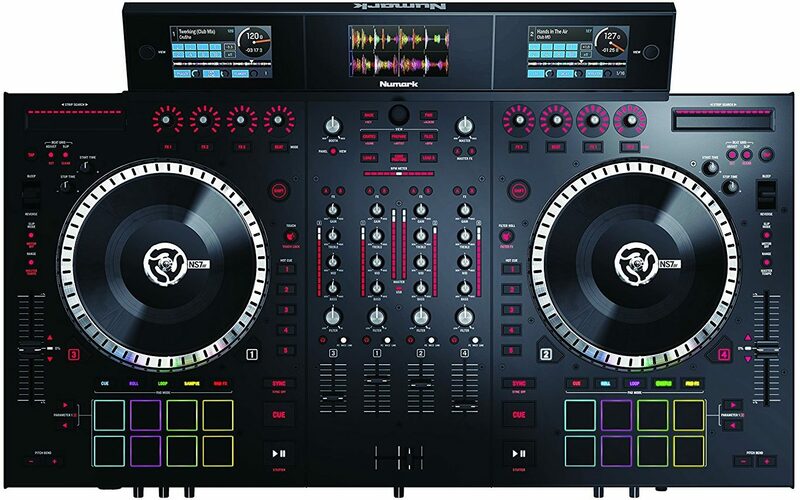 These full DJ mixing stations are geared towards the club DJ on the go, the performer who is interested in taking advantage of the live/remix elements of the included software, or the serious hobbyist willing to make an investment in their digital DJing habit. For some, they might be categorized as overkill. In the premium lineup, you can’t really go wrong. It all comes down to a matter of what DJ software you want to control, the amount you’re willing to spend, and personal preference. (For: Rekordbox) A beast of a DJ workstation, which also lets you be a VJ using Rekordbox Video. 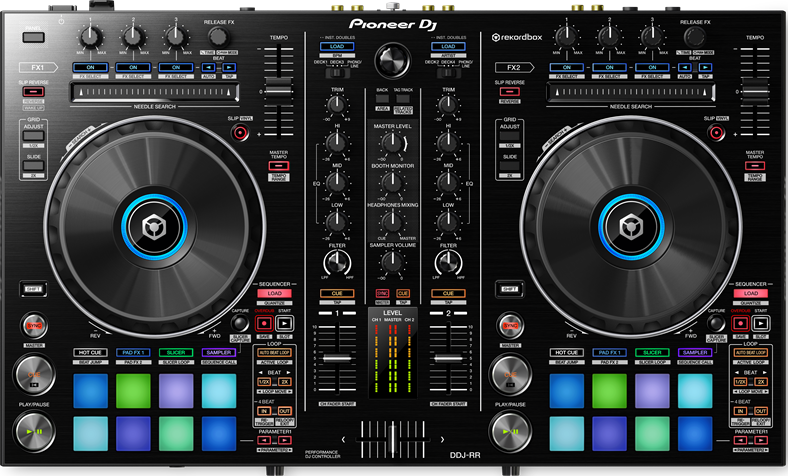 Pro: As the most feature-laden DJ controller in existence, you get a Pioneer Nexus type of workflow, with the added benefit of video mixing. Con: Although successfully mimicking a CDJ setup, it still requires a laptop… and it’s about as expensive as DJ controllers get. Choose If: You want a comprehensive Rekordbox experience and top-quality, or video mixing is important to you. 3 high resolution screens display vertical waveforms, track browsing, album art, and more. The mixer section replicates most of the functionality found in the industry-standard DJM-900NXS. A 96KHz/32-bit D/A converter made by Asahi Kasei ensures that the tracks you play will be heard in pristine quality. Gain access to “Color FX”, the Rekordbox DJ built-in effects, and OSC Sampler. Adjust the jog wheel to feel more “light” or “heavy” to suit your preference, just like high-end CDJs. Close your laptop and gain control over Rekordbox DJ and Rekordbox Video directly on the hardware. One device to be DJ and VJ. (For: Standalone, Serato) Denon’s mic-drop includes features previously unheard of in its price range… no laptop needed. Pro: Operates fully standalone (no laptop!) 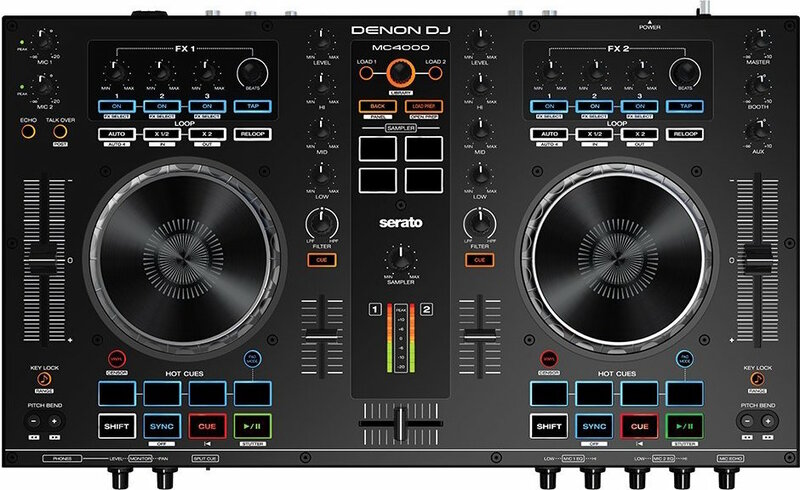 via Denon’s Engine technology, or as a high-end Serato controller with dual USB and high-res screens, at an affordable price point. Con: Serato DJ is still a more comprehensive experience than Engine… and standalone is 2 channel only (though you can use Engine and Serato simultaneously). Choose If: You want a killer dual-USB Serato controller at a killer price, plus handy standlone functionality. Standalone mode only works with two channels, but that doesn’t mean it isn’t useful. For example, if your laptop crashes, there’s comfort in knowing that the unit itself can bail you out. Some DJs prefer the assymetical layout, as opposed to the Pioneer DDJ series (which puts the left deck’s pitch fader on the mixer side). The MCX8000 gives lots of options. Essentially any DJ can walk up to it with music, and begin playing. The MCX8000 supports Pitch Play (and ships with Serato’s “Pitch ‘n Time” plugin), allowing you to play your cues across a different range of keys. High-res screens provide easy access to Serato DJ, and enable you to play standalone. The screens are similar to those found on the Numark NV. Touch strip / needle drop adds to the already large feature set. 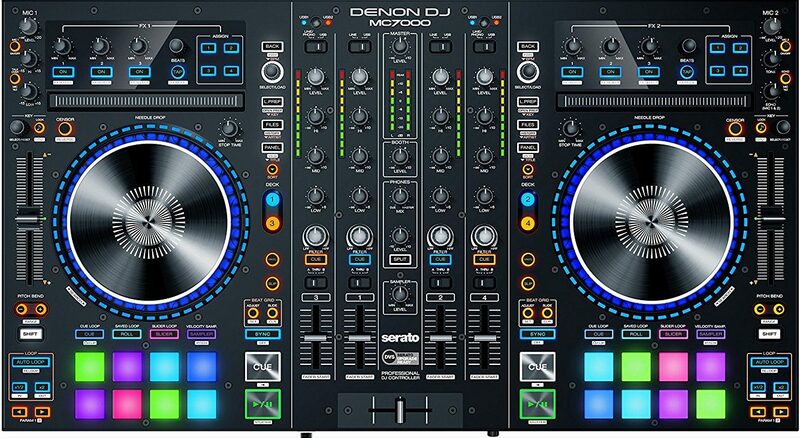 (For: Serato) Denon continues to up their game, presenting an impressive feature set at half the price you’d expect. 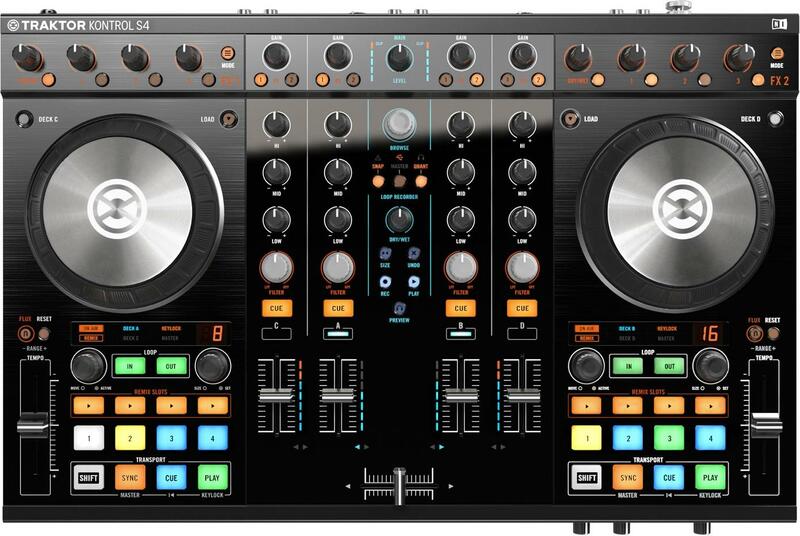 Pro: Dual USB ports (easy DJ switch-overs and B2B), DVS capability, key-matching controls and rugged metal construction makes this controller a high-value purchase. Con: It’s about twice as heavy as a DDJ-SX2, despite being slightly smaller. Choose If: You want a premium Serato experience, especially for more than one DJ at a time. Dedicated key sync and key change controls, for harmonic mixing purposes. 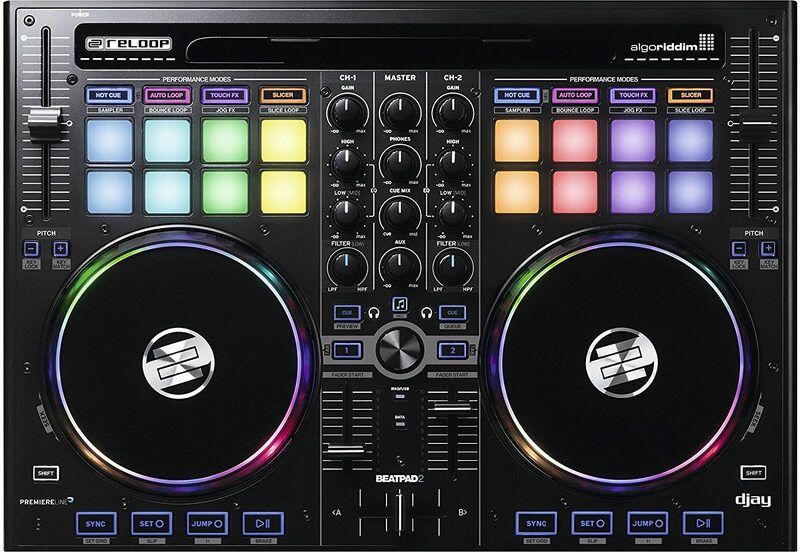 The MC7000 inherits most of the functionality of the MCX8000 (sans standalone capability and screens), making this a great option for Serato-only DJs. Twin USB jacks on the back allow two DJs to do back-to-back sets, and allow for easy changeovers without a break in the music. At a smaller footprint than its bigger sibling, this controller might appeal to DJs looking for something a bit more compact. The 6″ jog wheels are touch-sensitive, and the onboard LEDs give you lots of visual feedback. (For: Traktor) The flagship offering by Native Instruments provides the most tightly-integrated Traktor experience available. Pro: It provides the smoothest Traktor experience available, thanks to high-res screens with a smart UI. It gives easy access to Remix Decks & Stems, and is a great option for DVS users. Con: The lack of jog wheels is a deal-breaker for some DJs. Choose If: You want the laptop out of your face, you are “all-in” on Traktor, and you need flexible standalone options. The high-resolution screens combine with touch capacitive controls and a well-designed user interface, making the S8 a pleasure to use and to look at. Mix external sources (like turntables or CDJs) with the provided inputs, or combine with timecode records and Traktor Scratch for a great DVS experience. Gain full access to Traktor’s more advanced features (like Remix Decks and Stems) without ever looking at your laptop. Access each Stem or Remix cell individually, using dedicated faders. These touch strips provide a surprisingly suitable replacement for jog wheel functionality. Whether using single or “chained” FX, you can gain full control using the FX knobs, and get visual feedback on the screens while doing so. (For: Serato) Get the feeling of mixing vinyl records, but the features of a modern digital DJ setup. Pro: 7″ motorized vinyl platters and slipmats feels a lot like mixing records, but you get all the benefits of DJ software and a digital collection. Con: It’s huge and heavy, and there are no hardware filters (for standalone mixing), imperfect screens. Choose If: You love the feel of mixing vinyl, but prefer the convenience of digital DJing over a more cumbersome DVS setup. The NS7III ships with high-res displays. If you have the (largely similar) NS7II, you can purchase the display as an add-on accessory. The NS7 series is the only controller of its kind, providing the feel of mixing records using actual mechanical platters (complete with slip mats). The third middle screen can display parallel waveforms, or can serve as a dedicated browser screen. The NS7III features genuine AKAI PRO performance pads for controlling sampler, hot cues, roll & slicer. The EQ and FX controls are touch-sensitive, which makes them fun to use. It’s important to note that the low/high pass filters are software only, which means you can’t use them with external sources. Pro: The quality is seriously pro-grade, and it closely emulates Pioneer CDJ workflow. Dual USB is awesome. Con: It’s quite large… and for many, prohibitively expensive. Choose If: You want a club-standard feel (but not a Nexus price), you want high-quality pads, and you want the best screenless Pioneer controller available. Aside from slightly cut-down FX and lack of send/return, the mixer section is largely reminiscent of a DJM-900NXS. Connect four external sources, and utilize two different USB sockets in order to switch seamlessly from laptop-to-laptop. The SZ and RZ both feature the ability to “tie” decks 1 and 3 (or 2 and 4) together, for simultaneous manipulation. Some scratch DJs will find creative uses, here. 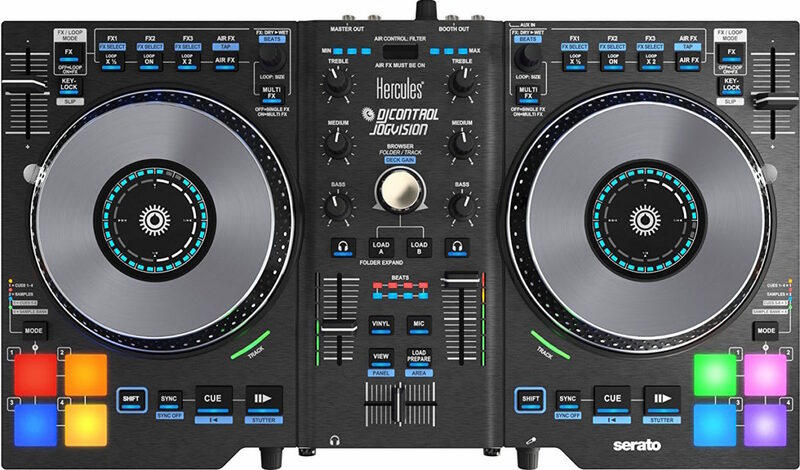 These controllers are, essentially, the next best thing to a full CDJ/DJM “industry standard” setup… aside from its need for a laptop, of course. Adjust the tension of the jog wheel, so that you can have the amount of mechanical resistance you prefer. Working DJs will appreciate both the professional appearance, and the build quality. Pro: A CDJ-esque controller which inherits high-quality pads and digital cue display from SZ, and the build quality you expect from Pioneer DJ. Con: It’s smaller than the SZ but still bulky; no DVS support without a $99 upgrade. Choose If: You want fantastic in-the-box control, and a pro-grade feel, but a more reachable price than SZ. Featuring dedicated controls for Serato Flip, DJs can record, replay, and store flips right on the unit itself. The displays in the middle of the jog wheels are extremely responsive, and display cue point markers and countdown. 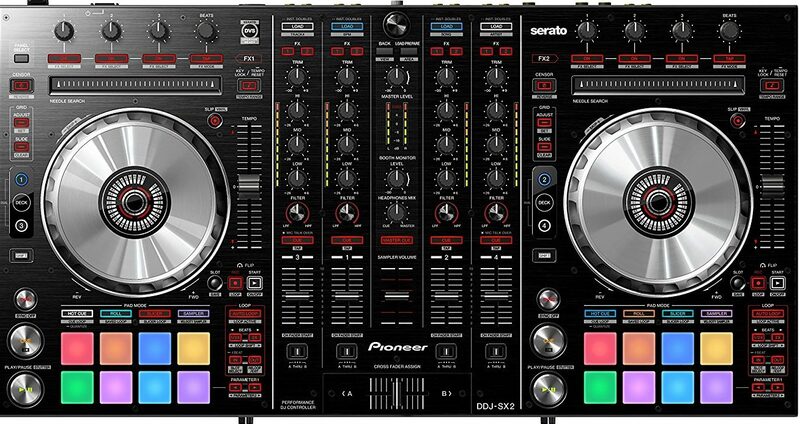 The DDJ-SX2 is ready for Serato DVS for timecode users, but it will require purchasing a software upgrade. The DDJ-SX was one of the highest-regarded controllers in terms of value. The RX and SX2 improve on this reputation with some nice tweaks. The performance pads are now RGB-backlit (which adds nice visual feedback from Serato), but are otherwise the high-quality pads you’d expect. Notice the asymmetrical design (the pitch faders are identically placed, instead of “mirrored”. The ever-impressive DDJ-RZX is the option for DJs who also want to be VJs using Serato Video, and it provides a very Pioneer Nexus-like experience (though it still requires a laptop). Of course, it will be either too large, or cost-prohibitive, for many. If you’re willing to ditch the screens and don’t care about video mixing, the DDJ-SZ (or Rekordbox equivalent RZ) provides an excellent alternative while slicing at least a grand off the price. For a very similar feel and approach, with a more reachable price, the DDJ-SX (or DDJ-RX) is the ticket. You still get all the major functionality, and save some cash in the process. Just note that you will need to pay for a software upgrade to use timecode. For Traktor, the S8 is the most fully-featured and well-integrated controller currently available. The touch-sensitive knobs, high-quality onboard screens, and smart UI design make for a pleasant experience. However, you have to be willing to give up jog wheels. For more about the entire lineup of Traktor controllers, check out The Unofficial Traktor Kontrol Mega-Guide. Denon’s certainly not playing around, these days. Their MCX8000 has an amazing set of features for the price, including the ability to not use a laptop at all (as long as you’re only using two of the decks…) As a Serato controller, you can’t be disappointed. The MC7000 is basically what you get when you take away the “standalone” functionality and screens. Both of these are excellent choices, and have been well-received by DJs and reviewers alike. The NS7III is great for DJs who want the feel of vinyl, but the convenience of digital. The motorized platters are tension-adjustable and you can even switch between 33 and 45 RPM modes. Like all others in this section, the NS7III works with external inputs as a mixer. “Bang for buck” is what digital DJing is all about, and this range of controllers makes for a perfect demonstration of this. These controllers sit between the mid-and-upper-hundreds price range. While they are perhaps not as feature-rich as some of the premium options, today’s midrange controllers are very club-oriented and complete. These devices provide everything you need to DJ digitally. These are all great options for the serious, but budget-minded, digital DJ. Today’s midrange controllers are impressive, and comparable with the Premium controllers of yesterday. (For: Serato) Version 2 of the first “screened” DJ controller, with some welcomed enhancements. Pro: It’s a great value, with built-in screens and a slim design at a great price. Touch-sensitive knobs and responsive UI allow Serato users to get the laptop out of their face. Con: There’s no standalone mixing, the pads are on the small side, and the screens aren’t quite as nice as the ones on Native Instruments controllers. Choose If: You want to use Serato, and you don’t want to stare at your laptop. The original NV was the first controller to bring information from Serato DJ to a set of integrated screens. In the NV2, Numark added beatgrid lines, enhanced track browsing, and improved the displays. Numark has included “Touch FX”. You can do cool stuff like apply a roll to a filter, or kill an EQ just by touching it. The NV2 includes nice, long-throw pitch faders for easy manual beatmatching. On the NV2, you can now “push to load” a track with the browse knob. Utilize 10 different pad modes for hot cues, loop slicing, and sample triggering. (For: Traktor) The S8’s younger sibling is a digital workhorse for serious Traktor fiends. Pro: It inherits Native Instruments’ smart interface from the S8, giving access to nearly all of Traktor’s features in a smaller footprint. Con: No mixing of external sources (which means no timecode records). And, of course, no jog wheels for those DJs who demand them. Choose If: You’re a serious Traktor user who wants access things like Remix Decks & stems, but doesn’t care about hooking up decks. Similar to the larger S8, the high-resolution displays reveal pop-up panels and key views from the Traktor software, which keeps you from squinting at your laptop. Tactile control over pitch-bending and scrubbing tracks is provided by touch strips instead of jog wheels. The Kontrol S5 is Remix Deck and Stems ready, straight out of the box. Touch-sensitive knobs interact with the screens to provide you the information you need, at the time you need it. 16 high-quality RGB pads allow you to trigger loops and cue points. Using the “Freeze” button, you can grab a piece of a running track and slice it up to re-arrange it. Pro: Fully USB powered, very portable, professional look and feel. The RR (Rekordbox) version was released later and includes RGB pads, Sequencer, and DVS access. Con: The SR is missing standalone mixing and RGB pads from upper-tier DDJ units. Small tempo faders. Choose If: You want a truly portable Serato or Rekordbox setup, which should last a long time. The DDJ-RR is an upgraded/improved version of the DDJ-SR, and is geared towards Rekordbox instead of Serato. The jog wheels are slightly larger, the pads are RGB, and it’s a bit lighter. Independent Channel and Master Out metering guarantees that you can keep an eye on your levels. A nice addition to the RR (not included on the SR) is the ability to adjust the beat grid using dedicated functions on the controller itself. Needle Search was added to the RR, giving similar functionality to Pioneer’s CDJs. Both the SR and the RR are “two channel, four deck” controllers. There are buttons on either side that allow you to enable decks three and four. Eight velocity-sensitive pads allow you to trigger samples and juggle cue points. They are single-color on the SR, and RGB on the RR. (For: Serato, Algoriddim djay) A lovely four-channel offering by Reloop, whether using a laptop or a tablet. Pro: While it’s a terrific Serato controller, you also get four-deck tablet mixing via Algoriddim’s software. Reloop provides mappings for Traktor and Virtual DJ as well. That’s versatility! Con: No external sources except a straight-thru mic… not even an aux input. Software DJs only. Choose If: You like having software options, or you want the ultimate iPad controller. The MIXON 4 is an industry first: it fuses together Serato and Algoriddim DJAY compatibility. This allows you to either use the world’s leading DJ software, OR DJAY’s tablet DJing and Spotify features, depending on the circumstance. The docking mount can hold up to a 12.9″ iPad Pro. Reloop has provided the first four-channel “tablet controller” via Algoriddim’s DJAY software. But there’s no need to feel limited, as it’s also Serato enabled, and Reloop even provides Traktor mappings. The unique “Macro FX” feature allows you to assign an effect to the knob filter, and control both simultaneously. Reloop provides ports for connecting any compatible hardware: USB for your laptop, USB plus for Android, and even a Lightning lead for iOS. True to Reloop form, the MIXON 4 has large, thin, high-quality jog wheels. 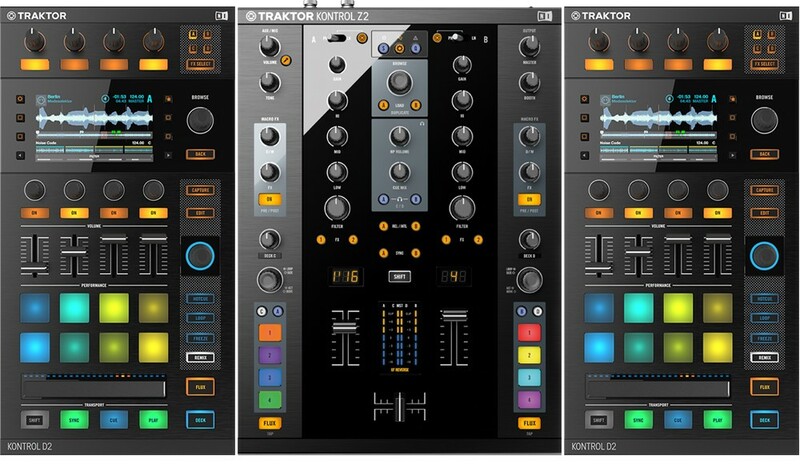 (For: Traktor) The second revision of the game-changing S4 is still a great option for Traktor-heads. Pro: It’s intuitive to use, boasts a ton of functionality, has strong community support, can be used with timecode, and can even be used for Traktor DJ on iOS. Con: There’s no standalone mode, and few customization options. Starting to get long in the tooth. 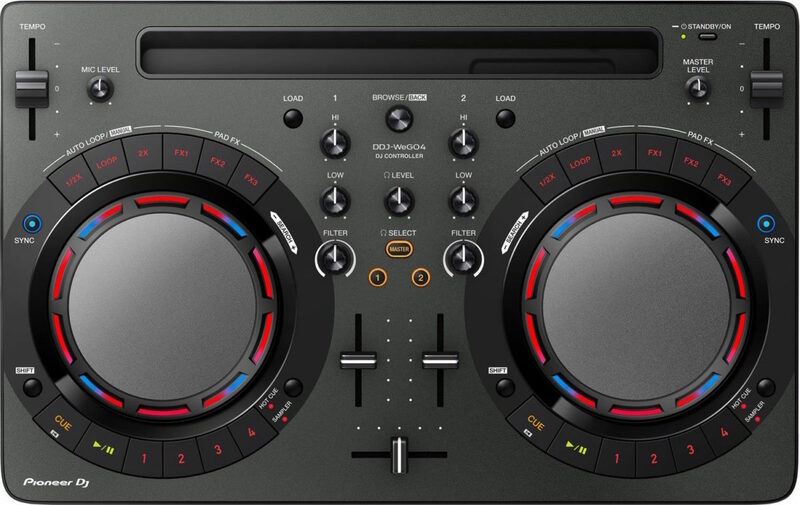 Choose If: You’re a 4-channel Traktor user, but prefer jog wheels over onboard screens. While it doesn’t have the screens and visual feedback of the S5 or S8, you do get dedicated access to Traktor’s Remix Slots. The pitch faders are adequately long, to enable easy manual beatmatching. The MK2 version added bright, RGB buttons to enhance the look (and visual cues) over the original. Record loops from any channel (or mic audio), and then overdub them on top of each other to create live remixes. Access Traktor’s dual independent FX units… over 30 of them are included with the software. The number digit displays show you the size of the loop you’re setting, without having to look up at the screen. (For: Serato) Top-notch Serato control, in a sleek (but tough) exterior. 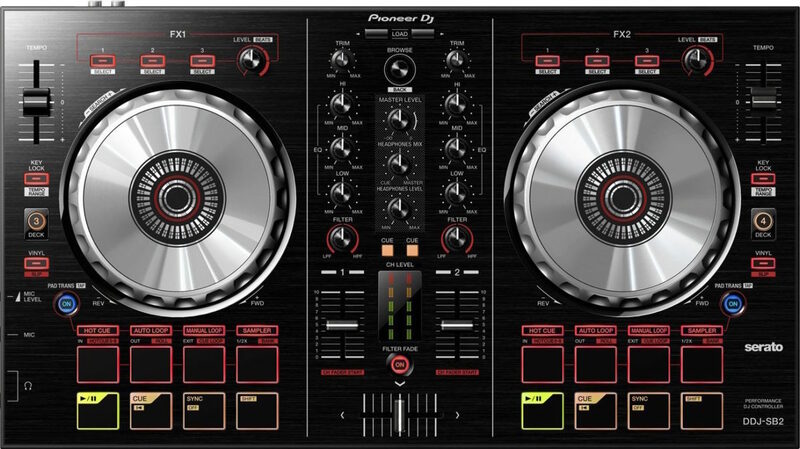 Pro: You get great quality, solid controls, large jog wheels, and full Serato DJ included. Con: There are no dedicated “Master Out” or 3/4 channel meters, and no inputs for decks for standalone/DVS. Choose If: You only plan on mixing “in the box” with Serato, and you want one of the best dedicated controllers for that task. The jog wheels are large (yet thin) and feel very solid, as is common on Reloop controllers. Nice, long pitch faders are provided for those who like to beatmatch manually. The 16 RGB pads with black centers give the Terminal Mix 8 a coloful, yet classy, look. The high-quality metal construction feels nice and sturdy, which gives confidence when bringing it to gigs. The EQ and FX knobs are made of hard plastic, while the Master Volume/filter controls have a nice rubberized coating. The crossfader feels accurate, crisp, and sturdy. Scratch DJs will feel right at home. (For: DJAY) A compact controller especially for those who are all-in on tablet DJing. Pro: The compact footprint and tablet-oriented designmeans it will fit easily into any DJ booth. Spotify access is great for DJs who take requests. 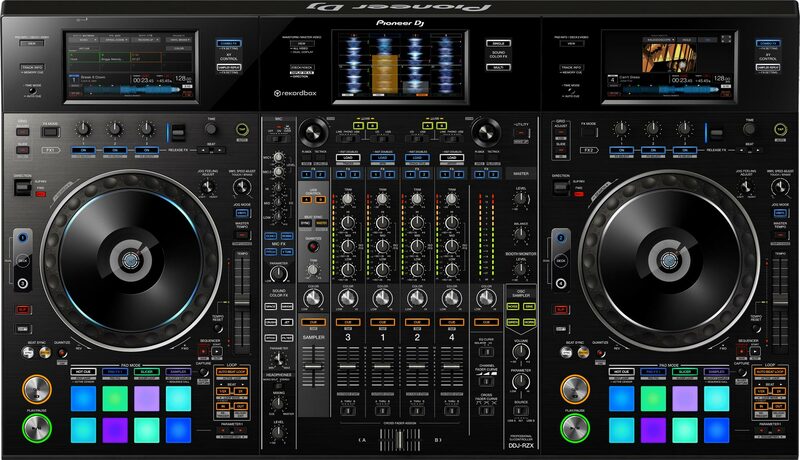 Con: For a controller geared towards DJAY and having only two channels, some DJs will have trouble justifying the price. Choose If: You are a DJAY user, you want to mix primarily on a mobile device, and you want something reasonably-sized. The Beatpad 2 is the only controller in this guide which is geared solely towards DJAY software instead of the “big three”, but its cross-platform support (PC/Mac/tablet), feature set, and build quality earned it a spot in the list. The Beatpad 2 is the first controller on the market to support the Slice and Slice Loop modes in DJAY 2. For those with a subscription, you get seamless Spotify integration thanks to Algoriddim’s software. Enjoy the big sturdy jog wheels and long-throw pitch faders that is now a given on Reloop gear. 8 cue points, and 6 samples per deck, can be triggered directly from the control surface. You can preview tracks with the browser function without loading the track into a deck… and a Queue List is provided, for dropping in tracks on the fly. The midrange controller market is extremely competitive… which is great news for us, as consumers! 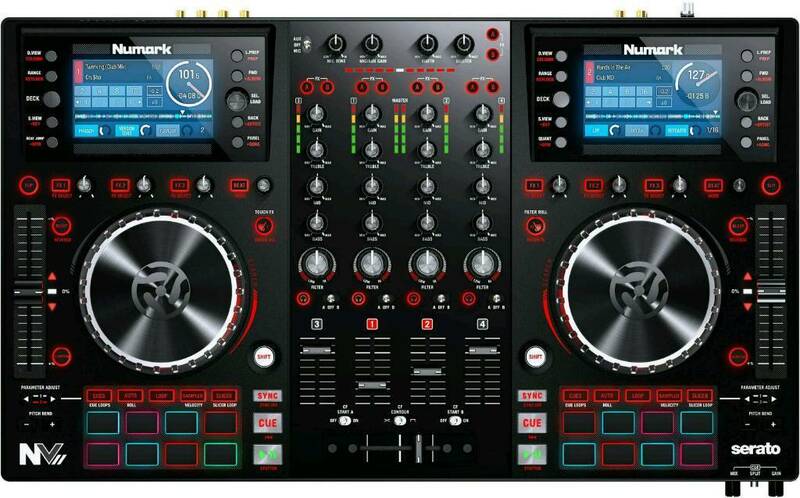 The Numark NV was the first controller to include onboard screens. The NV2 improves on the original with some nice details, such as smart touch-capacitive jog wheels which “learn” your style. This is a terrific option for Serato DJs that don’t want their laptop front-and-center, and at a great price. The Traktor Kontrol S5 is a killer value, basically being an S8 with slightly less control over Remix Decks (and without DVS support). What remains is essentially the same premium experience that you get out of its more expensive sibling. Of course, the ever-popular Kontrol S4 is still a great option for those who don’t need screens. The MK2 features tight software integration, basic Remix Deck and Flux Mode support, and even iOS compatilibity. Check the Unofficial Traktor Kontrol Mega-Guide for more info. Reloop has a solid foothold in the bang-for-buck department, and all their controllers feature solid construction and big heavy jog wheels. The Mixon 4 is the ultimate iPad controller, but also works with just about any DJ software you throw at it. The Beatpad 2 is another great tablet-oriented option (if you’re willing to use DJAY instead of more “industry standard” software), and the Terminal Mix 8 is one of the best options for Serato users. Of course, Pioneer has their own entries here as well. The DDJ-SR and DDJ-RR are controllers which give you that professional industry look and feel; however, they are only two-channel. The RR made several improvements over the SR, but requires you to use Rekordbox. Serato DJ users will want to opt for the SR, after noting the differences between them. These entry-level controllers are great for new DJs wanting to get their feet wet without making a huge investment. They’re also well suited to seasoned DJs wanting a backup, or extremely portable, solution. While you won’t always find the extremely sturdy construction of the professional grade stuff, the market has matured in this price segment… today’s budget offerings feel more like pro audio gear than the toys they used to be. If you’re a beginner DJ, you’re on a strict budget, a casual hobbyist, you primarily play another media format, or you simply want the best bang-for-your-buck… these could be the digital mixing devices for you. (For: Serato) A techy upgrade for this extremely popular budget offering from Numark. Pro: It’s very spacious, has long-throw pitch controls, includes touch strips, and gives terrific visual BPM feedback. Conveniently, it’s powered by the USB connection. Con: The annoying loop functionality and so-so drum pads. Choose If: You have “fat fingers”, you want to learn manual beatmatching, and you like chunky jog wheels. 5-inch metal jog wheels provide high-resolution control to your tracks, and the handy digital displays in the center give you visual feedback right on the unit. For manual beatmatchers, the provided pitch sliders are 100mm long for making fine adjustments. Put simply, the Mixtrack Platinum is one of the best values in the DJ hardware market, with functionality that isn’t normally seen at this price point. Dynamic FX control and track scrubbing is provided by the onboard touch strips, sitting next to the pitch bend buttons. Mix with four decks using the deck-select function. The displays will let you know which deck is currently active. The displays allow you to monitor deck selection, platter position, BPM, remaining time, key lock, and pitch adjustment. (For: Rekordbox, WeDJ, DJAY2, VirtualDJ) A compact controller with sleek design and versatile software support. Pro: With a small footprint, great software support, iOS compatibility, and a clean design… the value cannot be overstated. Con: The unorthodox layout may require some adjustment, it has tiny pitch faders, and it looks a little more “toy-ish” than other controllers in this price range. Choose If: You aren’t sure which software platform you want to try, or you want a lot of functions in a tiny space. A free Rekordbox DJ license is included, but the WeGO4 can also be used with DJAY2, Virtual DJ LE 8, and Pioneer DJ’s new WeDJ app. The button layout is a bit unusual, and may take some getting used to. However, it allows the WeGO4 to be one of the most compact controllers on the market, while still feeling spacious and clean. The slot at the top of the unit gives adequate space for a 9.7″ iPad. Unlike most controllers, the WeGO4 opts out of the 3-band EQ, in favor of a 2-band with filter. Pioneer has muted the styling of the latest iteration of the WeGO line, making it look a little more professional. The back of the unit has a jack for connecting your Lightning or USB to Go cable. Pro: It’s a smart budget choice, with a similar look and feel to its bigger brothers. The jogwheel tension feels like CDJs, and they are more “professional looking” than many budget controllers. Con: Limited FX controls, and a lack of master output level metering. Choose If: You like the “Pioneer style” of design/feedback, you want to try scratching. The SB2 provides switchable four-deck controls, but RB users will need to wait for an updated version. The RB and SB2 look like serious devices, and prove that budget-minded shoppers no longer need to make serious compromises. 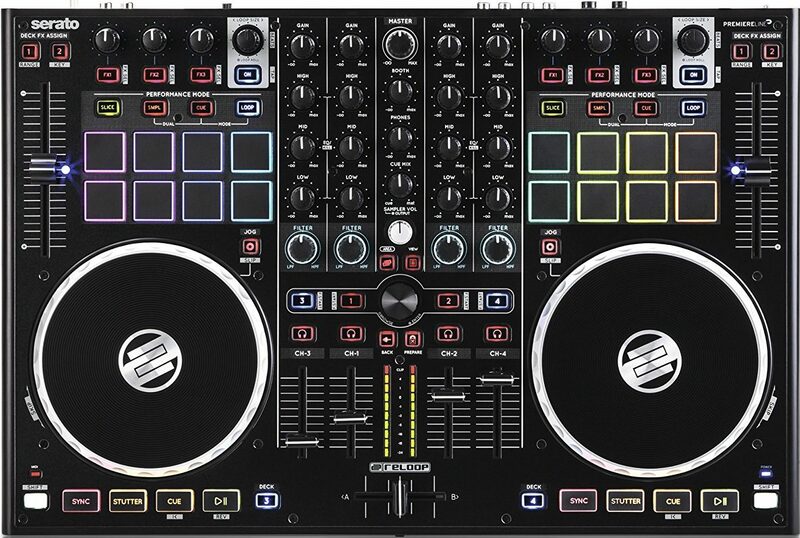 The DDJ-RB gives you eight performance pads, whereas the SB2 reserves the bottom four for transport controls. The SB2 might be considered a better deal than the RB, because some features were eliminated on the RB… but the SB2 is also Rekordbox compatible. One thing you do lose on the SB2 is the bottom row of performance pads, if that’s important to you. The jog wheels are large and chunky. Channel metering was added to the SB2 (and RB), having been notably absent from the original DDJ-SB. (For: Traktor) Budget-friendly access to big Traktor power. Pro: You can access all basic functions of Traktor in 2 decks, and you even get great mobile support with Traktor DJ for iOS. Con: The “Booth output” is half-assed. Choose If: You’re an iOS DJ, or you’re a Traktor user who prioritizes portability. The layout of the S2 is anything but crowded, and NI has thoughtfully crammed a lot of functionality into its fairly minimalist design. The Kontrol S2 is the ideal controller for Traktor users wanting to use their iPad instead of a laptop. The jog wheels are silicone damped, and now contain aluminum top plates. Access your cue points and Remix Slots using the four RGB pads above the transport controls. The gain knob shares duty with the filter function, accessible via the Shift button. Nice long pitch-faders for the manual beatmatching DJs. (For: Serato) One of the slimmest and lightest ways to have proper Serato DJ control. Pro: It’s about as small as all-in-one controllers get, giving you extreme portability, yet giving you access to all of Serato DJ’s major functions. USB power means it’s easy and fast to set up. Con: Very small pitch faders make manual beatmatching a chore, and the unorthodox side-mounted audio connections can make things awkward. No on-board gain controls. Choose If: You need extreme portability and want to use Serato DJ. As the smallest all-in-one controller available for Serato DJ, the Slate 2 represents the ultimate in portability. Rubberized RGB backlit pads are of surprisingly good quality, and allow you to control hot cues/loops, loop roll, Slicer, etc. The pitch faders, while present, are some of the tiniest ever seen on a controller… making this a more ideal option for sync DJs. The asymmetric design puts the Level knob in an odd spot, but it does get it out of the way of the EQ and filter controls. At close to an inch thick, the Slate is easy to slide into your backpack. Vinyl nudge and Slip Mode controls are located next to the jog wheels. 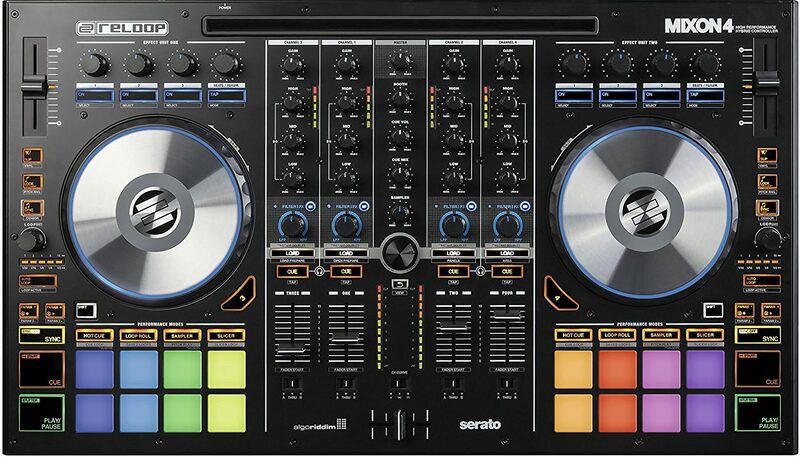 (For: Serato) A well-built, professional-looking device which is great for mobile and club DJs alike. Pro: The MC4000 is feature-rich when it comes to practicality. Club and Mobile DJs will both feel at home. Con: In some ways, it’s stripped down: there are only four pads, and there aren’t many fancy features like Slip Mode and Slicer. Choose If: You want a no-fuss, professional Serato experience at a reasonable price. Geared towards working mobile DJs, the MC4000 includes pro-grade steel construction which will help it last. The MC4000 includes Serato DJ Intro, but is also compatible with the full version… as well as Traktor 2, DJAY 2, and Virtual DJ 8. 100 mm pitch faders enable you to make the finest adjustments. The sleek black color scheme and rugged metal design make the MC4000 one of the most pro-looking controllers in its price range. The jog wheels are touch-activated, and are accurate enough for scratching. Echo and Talkover functions for the working mobile DJ. (For: Serato) How to get professional-grade jog wheels, and good build quality, on a budget. Pro: Its brushed plastic, build-quality, and massive jog wheels with visual feedback will give confidence when shelling out your hard-earned cash. Con: Those big lovely jogs come with a few compromises, such as limited pad functionality, combined FX/looping controls, and small-throw pitch faders. Choose If: Your priority is quality jog wheels and visual feedback from Serato. LED displays in the middle of the 5.9″ jog wheels show where you are in the track. The jog wheels are touch-activated, in addition to providing visual guidance. DJs can manipulate the low-pass filter, literally by putting their hands in the air, using Air Control. The backlighting on the RGB pads changes according to the mode (Sample or Cue point), and the color will match the default color of the Serato cue points. The blue ring shows the playback speed of the track, whereas the white ring shows the position within the track. Hercules added a unique “Beats” meter which shows whether or not your tracks are in sync. Please note that these controllers are fully capable and functional devices in their own right, but some of them will ship with “lite” software… so make sure to factor in a paid upgrade for any software features you want to use that aren’t already included. Numark has been releasing impressive budget offerings in the controller market for years. The Mixtrack Platinum continues this legacy, improving on the ever-popular Mixtrack III by adding visual BPM feedback straight to the unit. Another company known for their impressive budget alternatives is Hercules, and the DJControl Jogvision delivers. The “Air Control” function seems a bit gimmicky, but with big chunky jog wheels and clever LED feedback, it’s a solid choice. 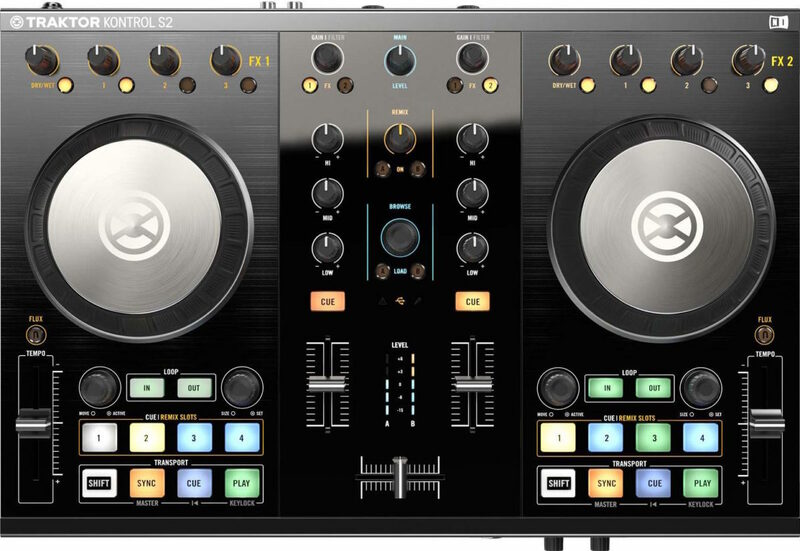 The obvious choice for Traktor in this range is the popular Kontrol S2. Not only does it ship with the full version of Traktor Pro 2, but it’s perfectly suited for iPad DJing with Traktor DJ. It even allows you to access Remix Decks on a third channel. The S2 is a proven performer in booths across the world. 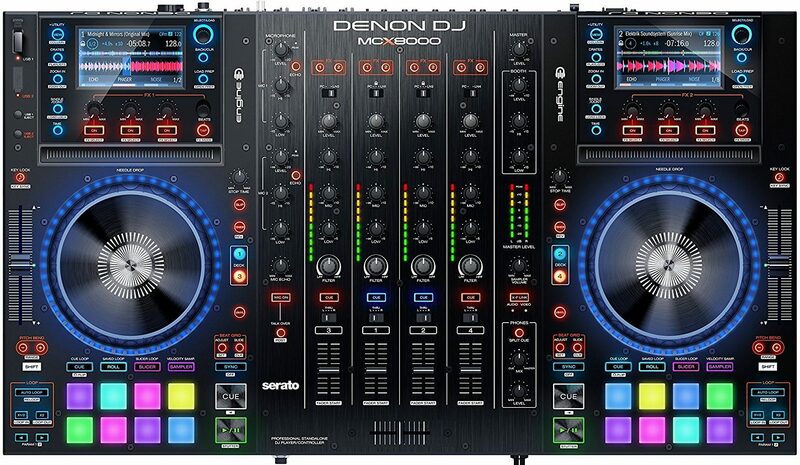 The Denon DJ MC4000 is a solid option for mobile DJs (due to its solid rugged metal design, talkover option, and minimalist design), but will still feel right at home in the club. 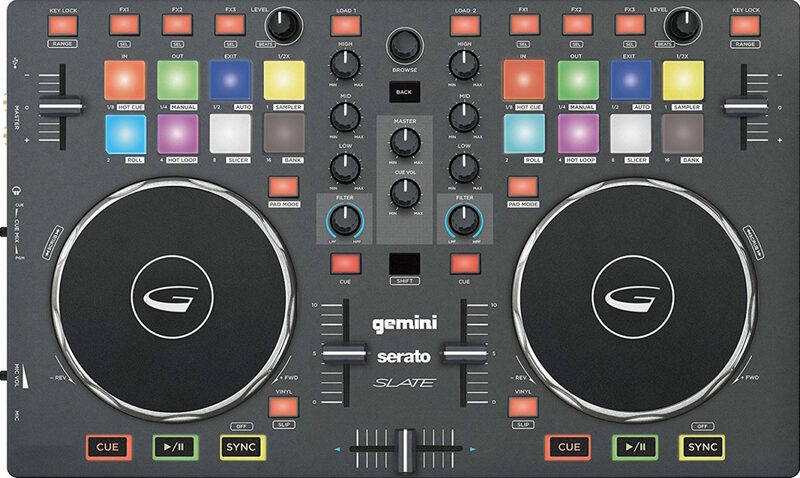 Or, for one of the most portable Serato options on the planet, consider the Gemini Slate 2. Finally, we’ll wrap things up with Pioneer. The DDJ-SB2 is one of the hottest-selling controllers around, provides that pro look and feel that many Serato DJs desire, and is a great option for anyone who wants to try scratching. (Rekordbox users can choose the DDJ-RB for a similar experience). The DDJ-WeGO4, while being a bit unusual in its button layout, is another great iPad option and is one of the more portable options around. While DJ controllers are MIDI-assignable (and therefore customizable), they are usually designed with some software-dependent features in mind. For example, a controller with onboard screens might show the waveforms of the tracks you’re playing… but this will only work when used with the right software package. If you’re looking for your first DJ controller, make sure you buy one that’s intended for the software you intend to use. You may want to consider what type of gigs you’ll be playing, before spending your hard-earned money! If you’re a professional club DJ, or you run a mobile DJing business, be willing to invest in something sturdy and easily moved. If you’re a scratch DJ (or want to learn), good jog wheels and a responsive crossfader are your priority. Bedroom/hobbyist DJs can choose whatever makes them happy, and fits within their budget! So far, we’ve discussed all-in-one solutions. But what if you want to put together a setup piecemeal? This is where modular controllers come in. While complete solutions are great, many people like the flexibility provided by a modular setup. This allows you to buy different “sections” at a time (such as a mixing controller vs. a deck controller). Check out The Unofficial Traktor Kontrol Mega-Guide for more information on Traktor components. Often, modular controllers are used for adding functionality to an existing setup (rather than trying to piece together an all-in-one controller a la carte). For example, at gigs around town, I often play on Pioneer CDJs (in HID mode with Traktor, which is like using them as controllers). In these cases, I bring a Kontrol X1 with me. This allows me to handle Traktor’s FX section (and other basic functions) while using a traditional hardware mixer. 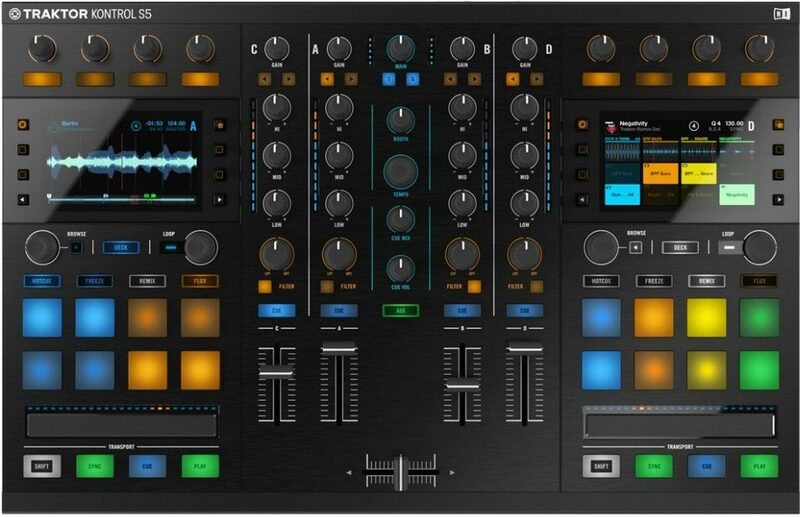 Sometimes, companies will release a controller specifically for some new DJ software functionality. 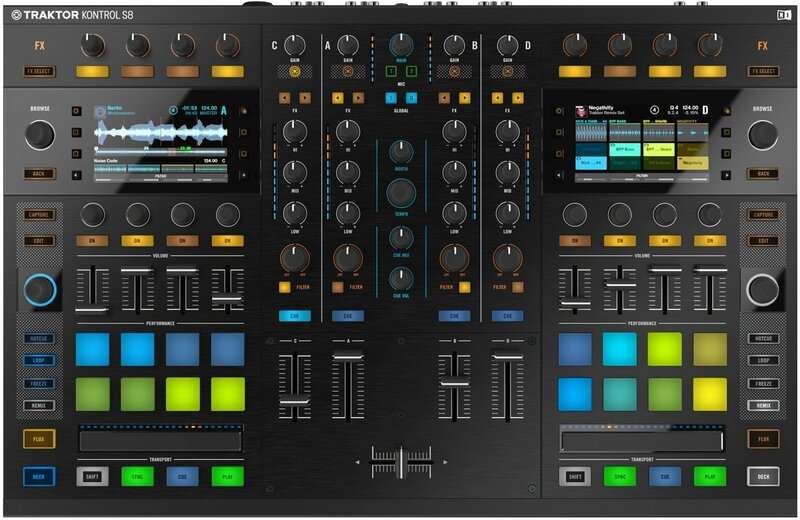 For example, controlling Remix Deck (Traktor Kontrol F1), adding Serato Flip capability (Reloop Neon), or adding cue point control to turntables with the Novation Dicer. You can shop for modular DJ controllers in our online store. Buying DJ hardware is only part of the equation. Our aim is to become better DJs through Passion and Purpose. Whether you’re here because you’re an aspiring DJ looking for your first setup, a seasoned DJ looking to upgrade, or just curious… I’d like to invite you to check out my weekly talk show: The Passionate DJ Podcast. Our show features inspiring stories, interviews with famous DJs, tips to increase your DJing skill, industry news, and much more. New episodes come out every Monday. Subscribe now via iTunes or via your favorite Podcasts app, and never miss an episode!